Do you remember waaaay back when we showed you our plans for the half bathroom? 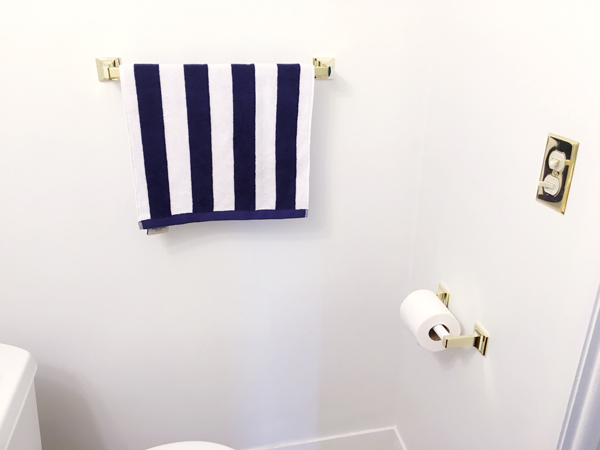 This is the bathroom that guests will use most, so we want it to be a good representation of our style. We made it one of our top priorities after moving in and started to update it right away … very slowly. I don’t want to wait until we’re totally 100% finished to show you what we’ve done, though, because who knows when that will be! So Iet’s take a look a “phase one” update of what we’ve done so far. While Andy and I tend to like things to be light and airy and modern, this tiny half-bath was just dark and heavy with the ornate mirror and light fixture and all that beige-on-beige-on-beige action going on in the tile, walls, countertop and wood vanity. 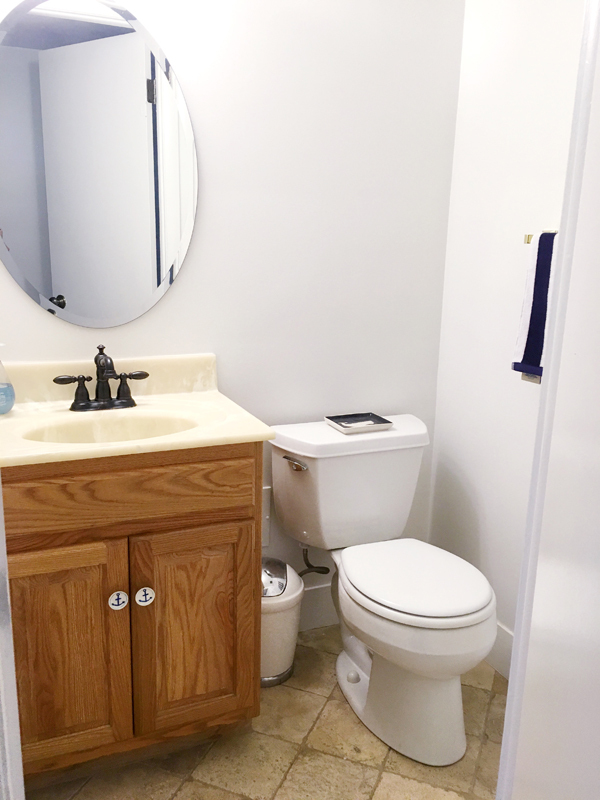 We definitely didn’t want to do a massive renovation or spend much money, but even without replacing everything, we knew we could give this room a whole new look relatively easily and inexpensively. We spent less than $175! And then we bought a whole lot of brass! Well the first thing we did was paint the walls and trim white — Sherwin Williams “Snowbound” (which we’ve used throughout the whole house, with eggshell on the walls and semi-gloss on the trim). This immediately brightened up the tiny little room. 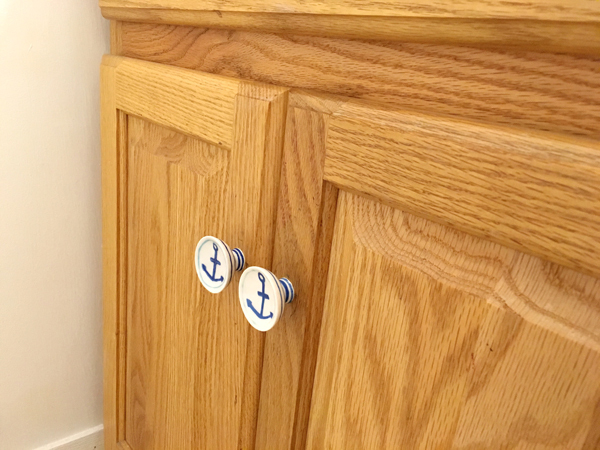 Then we replaced the mirror, light fixture, toilet paper holder, towel bar and the knobs on the vanity. Suddenly it was a completely different room. I say “suddenly,” but we actually took our time doing one project at a time over the course of a few months, because that’s how life goes sometimes. This light fixture is one of our favorite purchases OF ALL TIME. It’s impossible to get a decent photo of it in here, but take my word for it, seriously, it’s SO GOOD. I want to put this light in every bathroom ever. And it’s even affordable! When in doubt, go brass! That’s my motto, anyway. 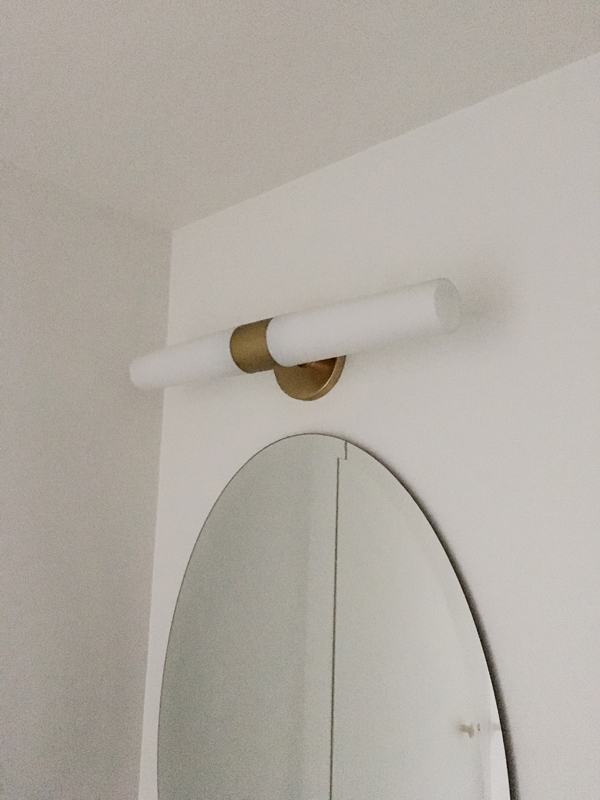 The shiny brass towel bar, toilet paper holder and lightswitch cover totally take the glam factor up a notch and make me very happy. Paint the wood vanity… So we were planning on keeping the vanity and painting it, but you know that Ikea gift card we got for buying our kitchen cabinets? We might as well use it to buy a new vanity for this room, along with the master bath, right?! We haven’t picked the vanity yet, but we’re leaning towards going to with a glossy white one to match our new kitchen cabinets and and make a cohesive statement. We also decided that while we’re replacing the tile in the hallway outside the bathroom, we might as well do the bathroom, too, especially since this room is so small it’ll only take a handful of 12×12 tiles. Replace the faucet. We bought an inexpensive brass faucet months ago, that we haven’t had a chance to install yet, BUT now that we’re replacing the whole vanity, we’ll need to get a different faucet. Replace the old ivory light switch and outlet with new white ones. Add art and style! OK, I’m going to be real honest. We’ve tweaked some parts of our whole-house design plan, which I’ll discuss further on another day, but I don’t think the nautical is really working with the direction we’re finding ourselves going. I have a few new ideas!! 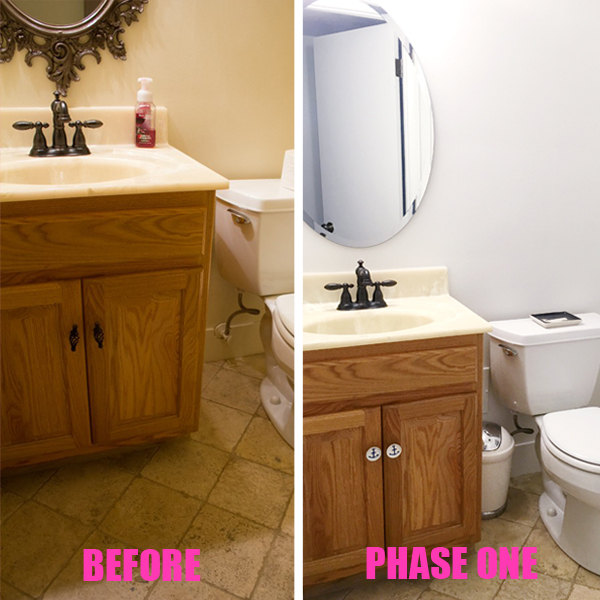 I love how much we were able to transform this room in Phase One, by spending less than $175. I think we successfully took this room from gothic dark to modern sophisticated! What do you think of what we’ve done so far?? It looks the same but worse? Loving the posts as I’m about to start a home reno myself. Question – why did you go with eggshell for all the walls and not satin? How did you pick that shade of white out of all the whites? 1. There were actually a few factors, but the main was probably that I decided I wanted to do all the walls and all the trim throughout the house in the same color (which our painter did NOT think is a good idea, but I think it turned out GREAT), so I went with eggshell on the walls and semi-gloss on the trim for a lot of contrast. 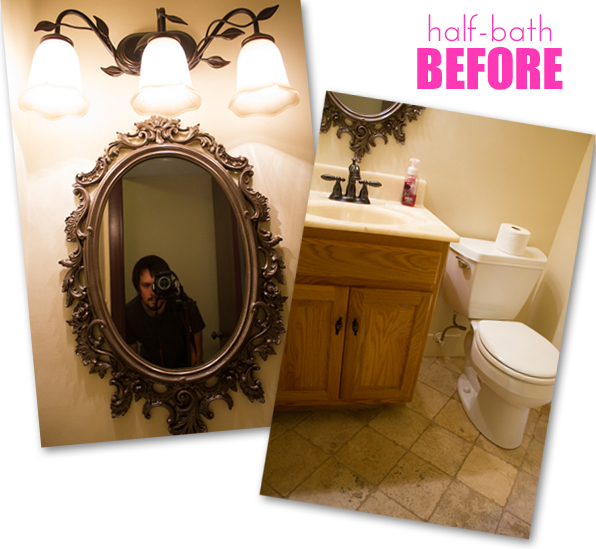 Satin is the more standard finish for a bathroom, but we did the two bathrooms in the eggshell and it seems fine. Pretty much the only reason we did eggshell in the bathrooms is because we didn’t want to buy any more paint!! 2. We looked at A LOT of paint chips! We got about 15 chips in various shades of white and taped them all up on a wall and looked at them over a few days. We like to play the “which is your favorite” game, mix them up and see if we keep picking the same favorite. Then we got a sample and painted it on a couple different walls to see if we still liked it. I also looked on Pinterest for other rooms that had been painted that color to see how it looked in other houses for a bit of context. I want to hear all about your renovation!! That’s so exciting.